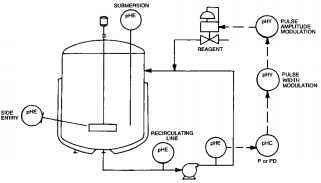 Figures 7.40.28 through 31 show four major methods of batch control of pH. Each of the figures shows four possible locations for the electrodes. The submersion assembly which enters from the top is difficult to remove, decontaminate, and maneuver. Since the bulk velocity even in well-mixed tanks rarely exceeds 1 fps, this electrode response is likely to be slow and prone to problems due to coating or fouling. The side-entry electrode tip should be close to the agitator impeller to take advantage of the local increase in fluid velocity. Retractable insertion assemblies with ball valves for isolation and with optional flush connections (see Section 7.7) are used to allow withdrawal while the vessel is full. Locating the electrodes in a recirculation pipeline is the best from the standpoint of probe response, self-cleaning action, and ease of access, but this approach is generally more expensive due to the need for block, drain, and bypass valves (not shown) for retractable installations or because of the cost of the flow assemblies when the pipeline can be emptied for removal of the electrodes. Electrodes installed on the discharge side of the pump have a slightly larger transportation delay than do those on the pump suction but are less likely to be damaged, because the pump strainer catches and the pump impeller breaks up clumps of material in the process fluid. When the reagent is added to the pump suction, the electrode must be in the discharge location for feedback measurement. The electrodes should be about 10 feet from the pump discharge and have double junction references to prevent contamination from the high-frequency pressure pulsations. FIG. 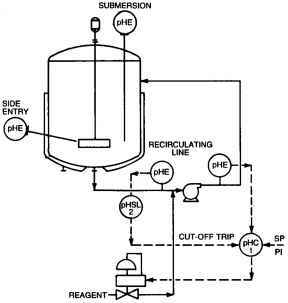 7.40.28 Batch neutralization can be controlled on-off valves. If the batch is basic the large valve might pH = 10 while the small one closes at pH = 8. FIG. 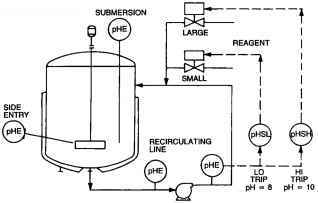 7.40.29 Batch pH control can be configured with a proportional and integral in-line controller (pHC-1) and a safety trip cut-off (pHSI-2) guaranteeing that the batch pH does not drop too low. FIG. 7.40.30 Batch pH control with pulse width and amplitude modulation of the controller output. FIG. 7.40.31 Batch pH control can be based on the size of the batch and the required cut-off of reagent based on the titration curve. a semi-batch mode. 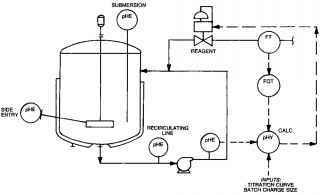 This can be done when sufficient vessel capacity is available so that the vessel discharge valve can be closed while the pH of the vessel contents is being adjusted during start-up or after a big upset. The third method (Figure 7.40.30) uses a proportional-only or proportional-plus-derivative controller (Fig. 7.40.17) with pulse width and amplitude modulation of the controller output to mimic the laboratory titration process. The further away the pH is from the endpoint, the bigger and longer are the reagent flow pulses. Manual mode outputs bypass the pulsation algorithms to facilitate manual stroking of the valve. While a variety of customized strategies can be developed to achieve the same result, this scheme has the advantage of a typical controller interface and tuning adjustments for operations and maintenance. The last method (Figure 7.40.31) uses the titration curve and the vessel volume to predict required charge of reagent and the setpoint for a totalizer. 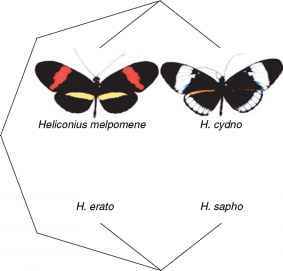 It depends heavily upon the accuracy of the curve and may best be implemented by partitioning the curve into segments and by using multiple charges. The titration curve should be corrected for temperature and for composition variations. Titration of samples taken just prior to the batch being charged could be used to verify the curve.